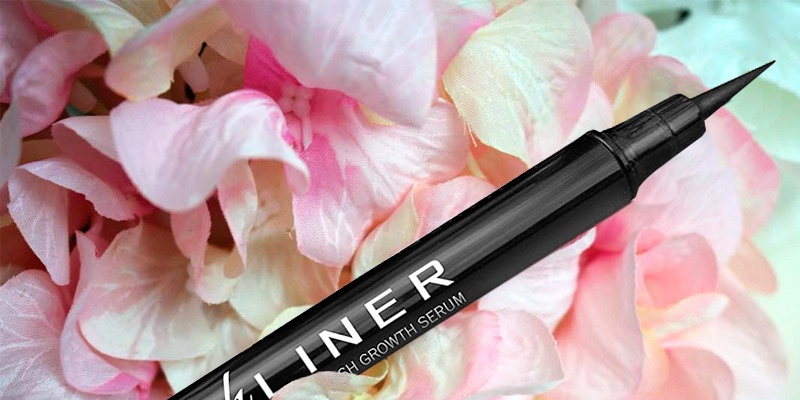 The eyeliner formula includes active serum with castor oil that strengthens the lashes and stimulates their growth. In just 60 days, you will notice the difference. The cap is a bit too tight. The Prolexa Liner will suit both professionals and beginners. 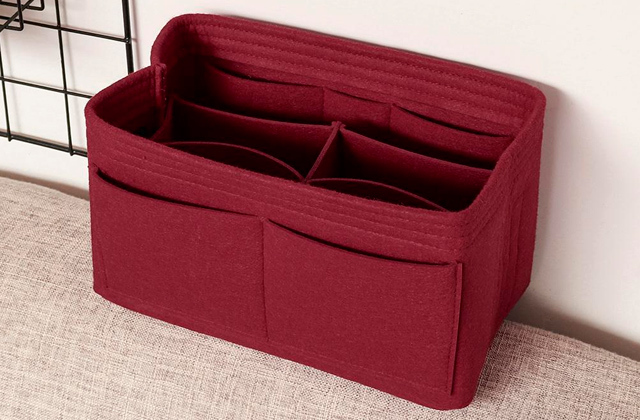 With its convenient tip, you can create a neat line almost effortlessly. Plus, thanks to the high-quality formula, it can make your lashes stronger. 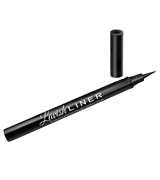 The liner is easy to apply thanks to the unique felt-tip applicator. 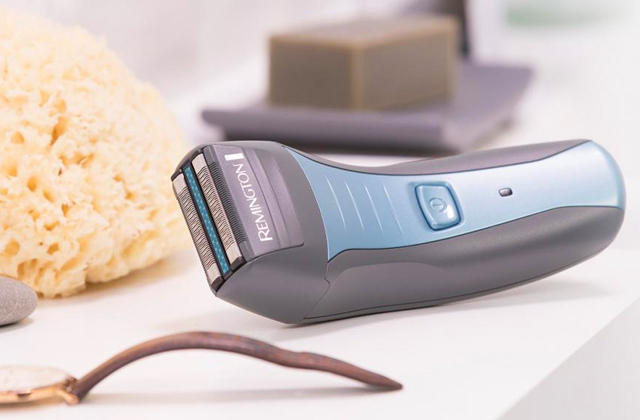 With its help, you will be able to create fine lines of any shape and thickness. theBalm Liquid Eyeliner will help you create the perfect wings. It has a liquid texture that dries quickly to a completely matte black finish that doesn't peel off or fade afterwards. Oils and vitamins that are included in the composition will make your eyelashes thicker and longer and prevent them from falling off. The tip is large, so making a thin line is tricky. 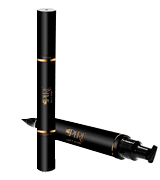 Thanks to the stamp applicator, the Lovoir Eyeliner will help you create sharp, even lines. The stamp is available in 3 different sizes: 8, 10 and 12 mm so that you can achieve any look you want. The eyeliner has a thick texture with bright glitters which don't fall down. 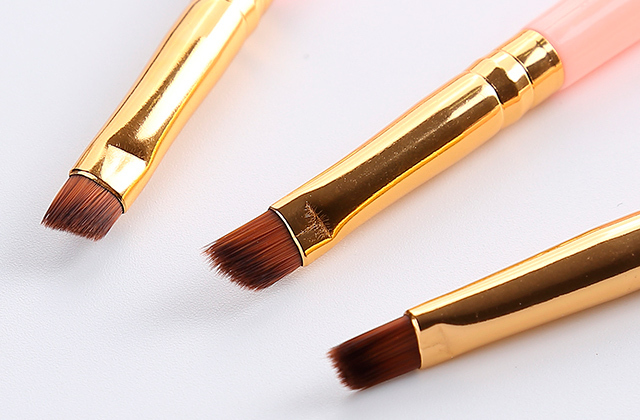 Thanks to the convenient brush, you can also use this product for lip makeup. Takes 5-10 minutes to dry completely. 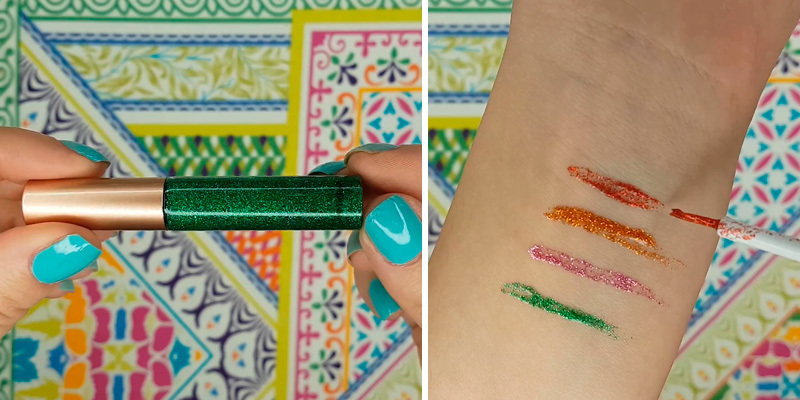 Using the Bestland Liquid Glitter Eyeliner, you will be able to create unique, bright makeup. 10 different color options allow you to mix and match them with different eyeshadows and try new styles. The eyeliner has a matte finish and is not afraid of moisture. It is also smudge-proof, so it will stay in place even if you accidentally touch your eyelid. Upon purchasing the LA PURE Origin set, you get 2 double-sided pens with a wing stamp. There are also 8 mm and 10 mm stamp options available to suit every eye type. 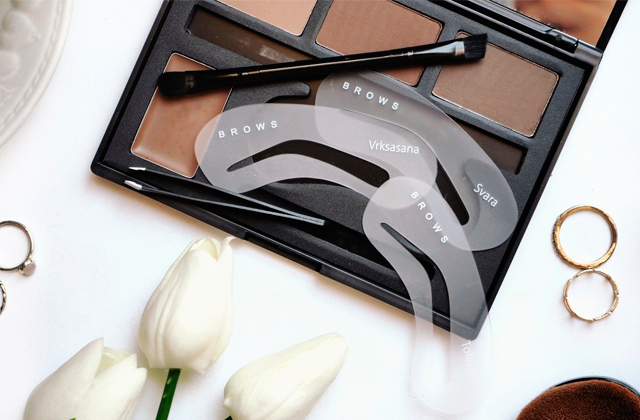 With the Pronexa Lavish Liner, you will be able to create any eye look you want. 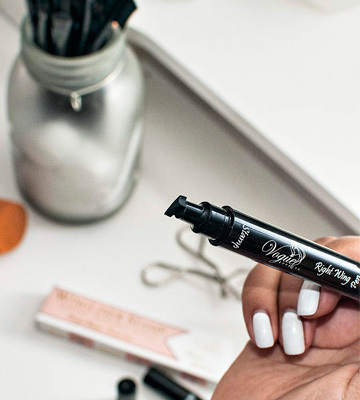 This eyeliner pen has a precise tip that allows you to create both thick bold cat eye, teeny tiny wing or a thin line between the lashes for some definition. 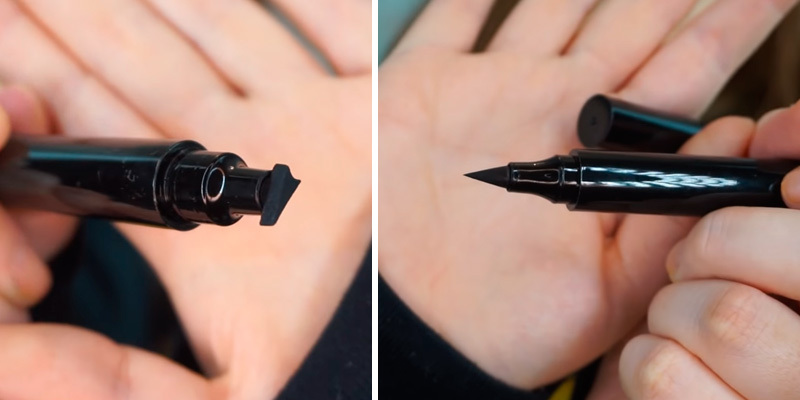 This pen has a matte black finish and will stay on the eye for the whole day. Plus, it is also sweat and waterproof, so it fears neither rain nor boiling sun. The Lavish Liner is not just a regular eye product - it stands out among others with its innovative formula. It includes an active serum with castor oil that strengthens the lashes and stimulates their growth. After just 2 months of daily use, your lashes will become stronger and thicker. In addition to this, the product is completely safe for use even on the most sensitive skin. 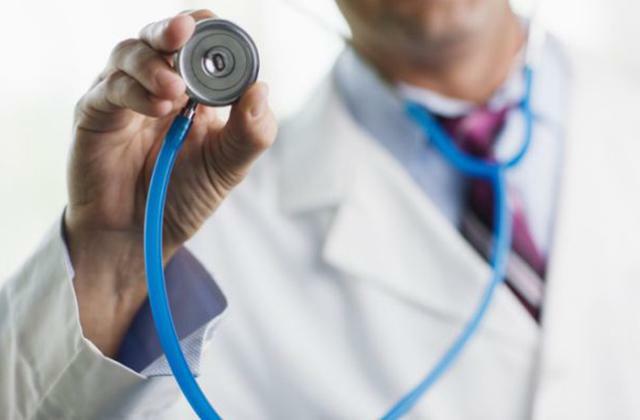 It is clinically tested and is proven to be hypoallergenic and non-irritating. The liner is made of only high-quality ingredients and is cruelty-free as well. The only problem with this eyeliner is that the cap is a bit too tight. So, you need to be very careful when opening it in order not to damage the tip. 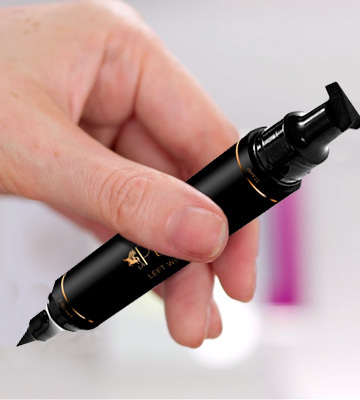 In all, the Prolexa Lavish Liner will suit both professionals and beginners. 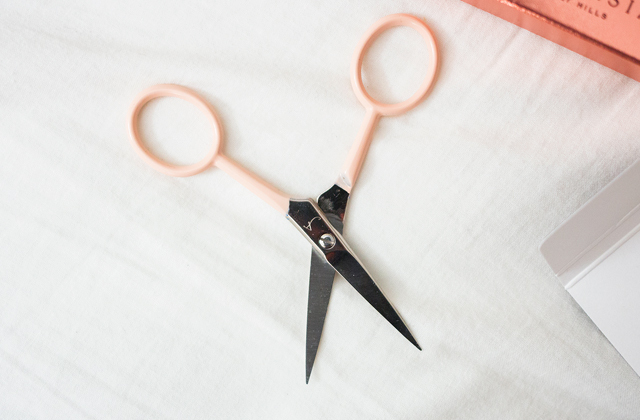 With its convenient tip, you will be able to create a neat line with minimum effort. And thanks to its unique composition, your lashes will become healthier. 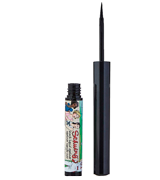 If you are looking for a liquid liner with a separate brush, theBalm Schwing Eyeliner is a great option. 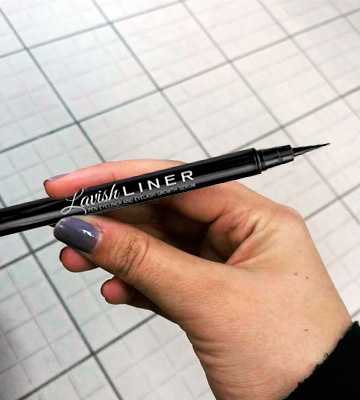 The liner is easy to apply thanks to the unique felt-tip applicator. It gives you full control over every stroke and provides you with incredibly smooth results. Using it, you can make fine lines of any shape and thickness. 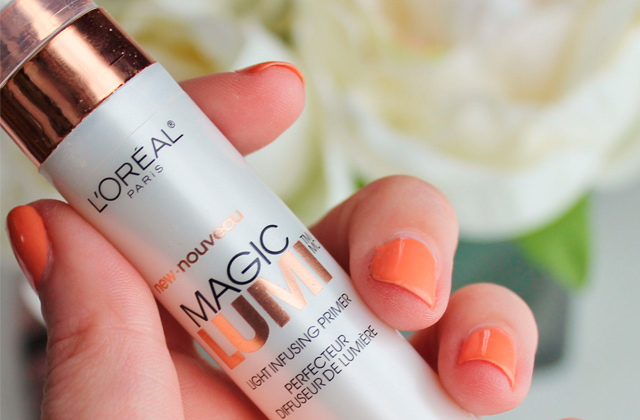 It works equally well no matter whether you apply it directly on your skin, primer or eyeshadows. This black eyeliner has a rich matte finish that doesn’t fade no matter how long you wear it. A lot of ladies also point out that it is not easily smudged and does not peel off. They really like that it dries really quickly. 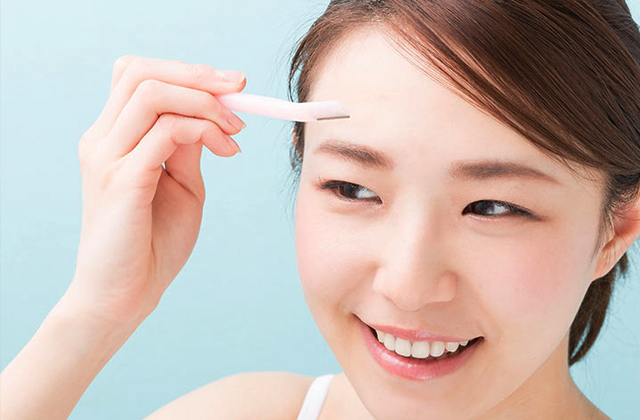 You can apply it and open your eyes immediately, knowing it won’t leave any marks on your eyelid. The next great thing about this liner is that it suits all skin types. 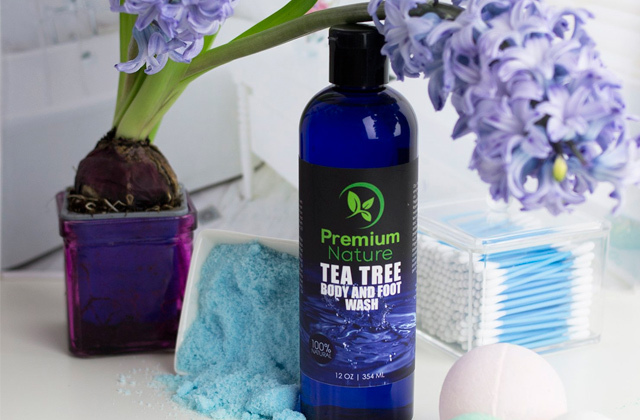 It is paraben-free and doesn’t cause any allergies. Importantly, it is also cruelty-free. Unfortunately, this eyeliner is not waterproof, so it may not stay throughout a rainy day. But the good thing is that you can easily remove it with some water without cleansing foams. 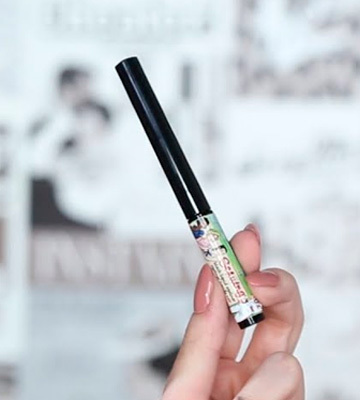 With theBalm Schwing Liquid Eyeliner, creating a perfect line has never been easier thanks to its convenient applicator. It has a liquid texture that dries very fast and creates a long-lasting matte finish. If you are not that experienced in makeup yet want to rock a perfect eye look every day, we highly recommend checking out the Lovoir Wingliner Stamp. This set includes two pens that have a regular eyeliner tip on one side and an eyeliner stamp on the other side. We all have those days when no matter how hard you try, you just can’t make your wings look identical. 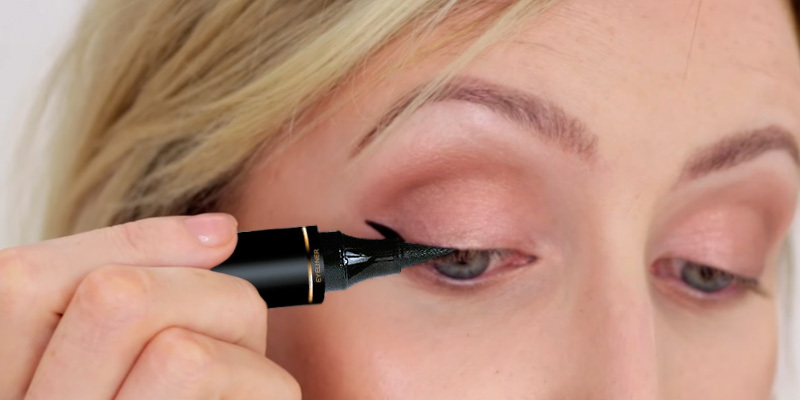 But with this liner, you will forget about this struggle. Just press the stamp tip on the outer corner of your eye and then line it with the other side. The lines will look sharp and defined. What is more, the stamp is available in 3 different sizes: 8, 10, and 12 mm. You also can purchase a Triple Pack Combo. 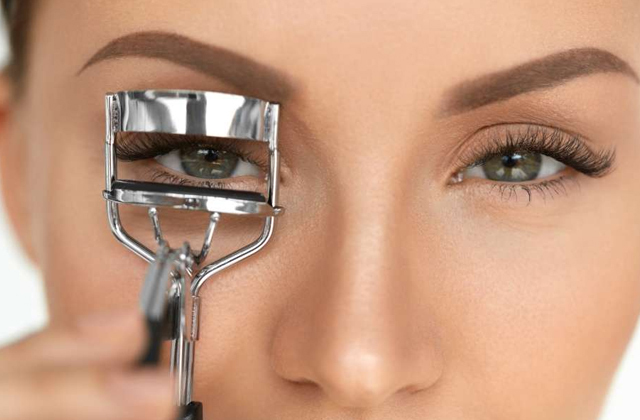 The other perk is that the formula includes various oils and vitamins that will make your eyelashes thicker, longer and prevent them from falling off. Also, we couldn’t skip the fact that the price of this set is more than reasonable. For a little more than $10, you will get not one but two liner pens. The only problem you may face when using this product is that the tip of the liner is a bit large. So, if you are a fan of very thin lines, it may be tricky to create them at first. Yet, we are sure that with some practice, you will be able to do that. In conclusion, the Lovoir Wingliner Stamp is your perfect assistant in creating a sharp, even line. It will help you emphasize the beauty of your eyes without spending too much time (and money) on makeup. It is truly one of the best eyeliners you can find in this price range. 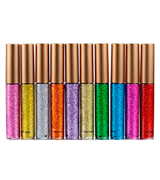 If you want to bring more color in your life, we highly recommend getting a Bestland Liquid Glitter Eyeliner. 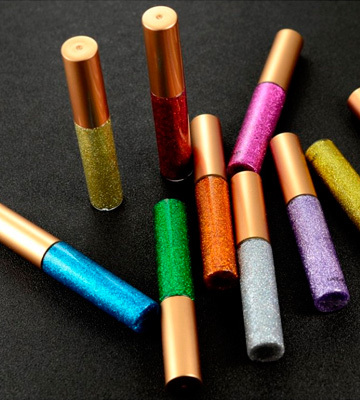 Upon the purchase, you will get as many as 10 liquid liners in the most popular colors - Silver, Gold, Blue, Green, Red, Orange, Yellow, Purple, Pink, and Dark Pink. The product has a rich texture and brings a beautiful shimmer effect to brighten up your every look. What is also great about this item is that you can use it not only on your eyelids but also on your lips. It boasts strong adhesion and will stay in place for a decent amount of time. This metallic liner has a metal pearlescent formula which gives it shiny, beautiful look from any angle. You can apply the product directly on the skin without any primers or glitter adhesives. It has a soft applicator that allows you to line your eyes and create unique designs. The only problem is that it might take a few minutes for the liner to dry completely. And if you have oily lids, we recommend you to wait for 5-10 minutes before opening your eyes so as not to smudge it. To sum it all up, the Bestland Liquid Glitter Eyeliner will help you create bright shiny makeup looks that can make you the star of the show. 10 shimmery colors allow you to experiment and mix and match with different eyeshadows. This kit is a must-have for those who love to shine on every party. 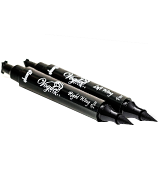 The LA PURE Original Eyeliner will help you create a perfect winged line in a matter of seconds. The thing is that this product comes with a convenient stamp at the end of both liners. There are 8 mm and 10 mm stamp options available to suit every eye shape. Hence, no matter whether you have hooded eyes or round eyes, the liner will help you create gorgeous makeup and enhance your natural beauty. We would like to mention that the tip of the eyeliner pencil is very handy as well. 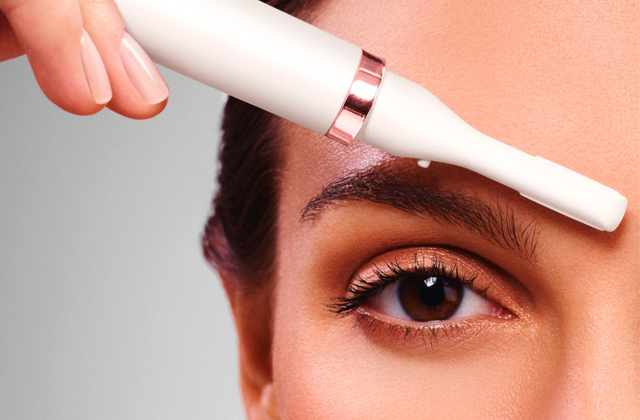 A lot of users point out that it makes tight-lining eyes a breeze. Thus, if you enjoy rocking a bold makeup look, this product is your reliable assistant in creating one. The under eye liner has a matte finish and is not afraid of moisture. It is also smudge-proof, so it will stay put even if you accidentally touch the eyelid. Because of that, it may be a bit hard to remove. However, this problem can be easily solved with a good oil-based makeup remover. In short, on purchasing the LA PURE Original Eyeliner, you get 2 double-sided pens - one for each eye. With their help, you will be able to easily create amazing makeups. It is also very long-lasting since it is smudge- and waterproof. We bet every modern woman has some sort of eyeliner in her makeup bag. This cosmetic tool is used to define the eyes, make them look more expressive and emphasize their beauty. 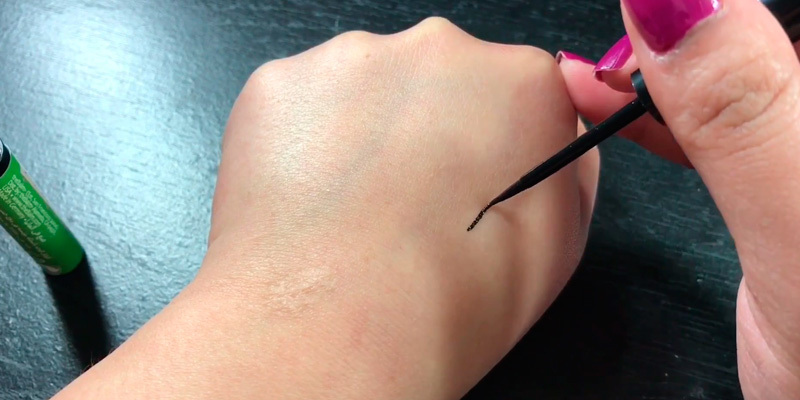 Eyeliners can be used both underneath and above the eye as well as on the waterline, and you can draw it as thick or thin as you want, enhancing or even changing the eye's shape. There are many different types of eyeliners available on the market, however, the most popular are liquid liners, eye pencils and powder based and gel eyeliners. The fact how long the liner lasts and how well it stays on directly depends on the type. Generally, liquid eyeliners show the best results, since most of them are water and smudge-proof. However, they may be a bit tricky to apply. They come in different styles such as an eyeliner pen, liquid liner with a brush or an eyeliner stamp. 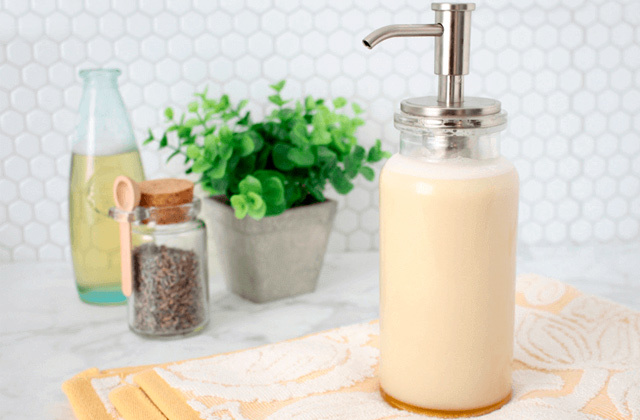 Naturally, it may take you some time to get used to each type of applicators. Gel- and wax-based liners are the most flexible, though. You can apply them with a separate brush of any size and shape you like. Yet, they are not that wearable as liquid liners, since most of them do not dry completely. Hence, they can be easily smudged on your eyelid. All in all, you need some time to find the perfect liner that will suit you, so we are here to help you. Also, if you want to create perfect makeup every day, we recommend adding to your organizer one of these eyebrow kits and face primers.